lag hier noch so faul rum. Da hab ich es mir geschnappt und es verarbeitet. Die Röschen sind mit einem Quilling- Tool aus Schleifenband gefertigt: Ist etwas fummelig, aber passte halt zur Schleife. Love the color combination. Thanks for playing along with us at Crafting by Design and our Anything Goes Challenge. This is such a sweet creation ... love your choice of colors/design! Thanks so much for joining us at The Sisterhood ‘Free For All (anything goes)’ challenge and please come back again soon! This is so pretty, Beate. Love those soft colours. Mensch eine tolle karte! I really love the teal color and that bow is fabulous. Beautiful card. Thanks so much for playing along with us in The Sisterhood of Crafters. Such a beautiful creation with great attention to detail. Thanks for joining us at Crafting By Designs. Good luck. 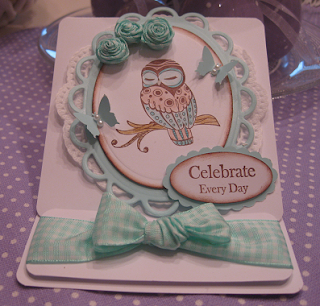 A great card - love that owl!